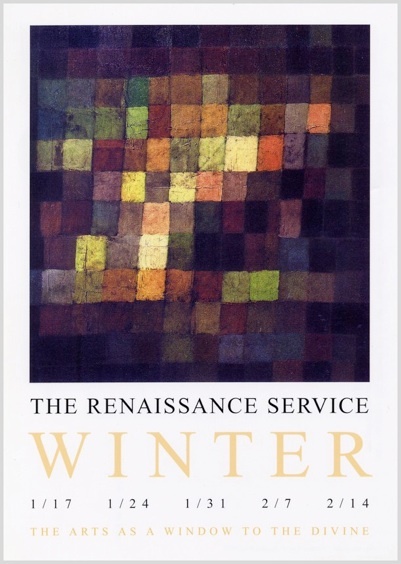 The Renaissance Service (TM) was conceived and developed by Heather Choate Davis in 2000 for First Lutheran Church of Venice. “There is no kit for something like this. Every slide, every poem, every featured artist was chosen with great care and crafted into a moment in time,” says Davis. These candlelit vespers were designed to both spark and reflect a renewal of faith and the Spirit in the Venice community, a swatch of Los Angeles with more artists—painters, sculptors, actors, novelists, photographers, poets, dancers, architects, designers, musicians and creative people of every variety—than almost any other neighborhood in the United States. Although our impression might be that the “art” world is a secular one, and that artists themselves are not likely candidates for anything as “conventional” as going to church, the crowds that gathered each Wednesday night (some coming from as far away as Pasadena, Hollywood, even Santa Cruz) testified to the fact that the leap an artist takes in his or her work—believing that with only the simplest of tools and the unique bent of their own mind’s eye they can make manifest a thing of truth, beauty and insight—is not so very different from the leap believers take each day. Perhaps, the man alone in the studio waiting for visions is already closer to God than any of us knows. Davis went on to create variations of this service for Lenten worship both here and at other churches, who commissioned her work. She was invited to be the liturgist at The Glen Workshop in Santa Fe in 2002 and 2003, where she worked with singer/songwriter Kate Campbell. She is forever grateful to Pastor Kenneth Frese for his belief in, and support of, this work including his deeply moving homilies on the narrative of the featured artist’s relationship to God. Selected Poems featuring Guest Speaker Fr. Gregory Elmer, O.S.B.